Between 2013 and 2015, a section of the bypass skirting the town of Horsham was widened from four lanes to eight lanes, to incorporate a system of slip roads for access to a new development. This meant that the bridge I stood on to take the ‘before’ photograph had to be replaced – a new bridge with a wider span was required. The old bridge was no great loss. Although it was ostensibly a ‘walking and cycling’ bridge, it was built at a time when nobody really thought about cycling, and consequently it was barely wide enough for two people to walk side-by-side, and obviously not sufficiently wide to accommodate cycling in a comfortable way. So… we got a new bridge, with a longer span. Is it better? The good news is that it is indeed wider, and has come fitted with dedicated street lighting, although unfortunately I doubt it will be wide enough to accommodate future demand, and it doesn’t separate walking and cycling. The really bad news is that the bridge has come accompanied with a whole series of obstacles that either deliberately or accidentally make cycling inconvenient. The deliberate measures are a series of slalom metal barriers, built into the bridge itself, presumably with the intention of slowing down people cycling on one of the access ramps. In addition, rather than smoothly curving around to join level ground, the end of the ramp has a pair of tight zig-zag bends, designed to minimise the footprint of the bridge (and therefore – surprise surprise! – to avoid the loss of any car parking spaces). These bends are just as awkward to negotiate as the barriers. Earlier this year, Horsham District Cycling Forum tried out a range of adapted cycles that West Sussex County Council provide for use on the nearby running track. It was an ideal opportunity for seeing just how difficult – or indeed impossible! – it might be to negotiate this bridge, and its obstacles, on non-standard cycles. Before we starting using them, my instinct was that it may indeed be impossible to negotiate the bridge, especially with the Van Raam wheelchair transport bike, shown in the photograph above. The bends and the barriers would simply prove too tight. However – and to my slight surprise – it did turn out to be possible. But only just. The turning cycle on the Van Raam is actually pretty good – the front wheels steer at the same time as the front part of the bike pivots, and that allowed me to steer around the bends, and through the barriers – although with only millimetres to spare. You can see my experience in the video below. Both the bends and the barriers are extremely tight, requiring a great deal of precision to negotiate. Although it is just about possible, we really shouldn’t be making life so difficult for people who might be using non-standard cycles. I was, of course, using the Van Raam without the weight of a passenger. Repeatedly having to come to a near stop to manoeuvre around the barriers and bends will make it pretty hard work for anyone with that extra weight, especially given the gradient of the ramp. The start of the video also shows the difficulties presented to users of these cycles by conventional ‘shared use’ footways. These arrangements might be relatively easily negotiable (at least at slow speed) by people on standard cycles, but it was pretty tight for me on the Van Raam. The dropped kerbs, bumps, slopes and tactile paving – as well as the relatively narrow width, shared with pedestrians – all make for unnecessarily hard work. It’s an important reason why the ‘shared use footway’ approach isn’t particularly inclusive. 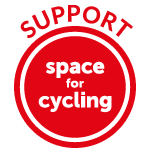 Designing properly for cycling should start with the basic assumption that it must be fully accessible for the full range of cycling vehicles that are available today. If we aren’t designing for that standard, then we risk making it extremely difficult or impossible for those users who are already at a disadvantage. A cycling bridge – over a much smaller road – in the Dutch city of Den Bosch, that has a smooth gradient, and no barriers or unnecessary obstacles. It is possible. This entry was posted in Horsham, Inclusivity, Infrastructure, West Sussex County Council. Bookmark the permalink. Great post highlighting the difficulties faced by disabled cyclists. The slalom gates are, more than likely, illegal as they, also more than likely, prevent disabled cyclists from accessing the paths. From the looks of the gate spacing both in width and depth, I’d bet that I can’t get either of my bikes through them. Similarly, they’d be hard pressed to get through the turn in the photo. While you highlight that the bike in the photo could barely get through the turn since the wheels steer while the frame articulates, you don’t have that same advantage on all cycles for the disabled. As a point to ponder, one of the most commonly sold handbikes has a turning circle of over 18 feet. This doen’t consider that some riders leg flexibility might make the turning circle larger and not every cyclist would be able to maintain the tightest circle while pedalling up the gradient. Even if a bike is able to get through the turn using a multipoint turn, you would have to question how useful that is in encouraging people to ride (it isn’t) or the blockage to other users that would occur when a bike is having to make a multipoint turn in such a confined space, in addition to the possibility of getting stuck if the turn were misjudged as a disabled rider likely can’t just pick up their bike and move it. Further, the blockages, hassle, delay, and obstruction would just be compounded if multiple disabled bikes were being used, so it discourages cyclists from riding in groups. Lastly, handcycling in particular is not limited to disabled cyclists so construction like this can quite possibly restrict all cyclists, able-bodied and disabled. To pick up on your point about the gates being illegal, this is AIUI an unwelcome aspect of the way UK disabilities law functions, in that nothing is “illegal” until taken to court by a disabled individual who has been personally obstructed in some way by it. As few disabled people have the time, money or energy to take a case to court, this rarely happens (and a byproduct of that is that some of those who do, can appear to be acting provocatively). It’s not simply a case of checking to see whether it meets the relevant standards. I completely agree. It’s as thought the disability laws are not actually law unless someone fights it. And, like many issues with the DWP, many disabled people done have the mean or energy to fight, as they are spending too much time trying to deal with their disability. I’d be happy to fight and I and others in my area are doing so, but you are completely correct, I think we are seen more as agitators, even though we are simply pointing out violations of existing laws that should have been abided by in the first place. Checking into all the relevant standards needs to be done as step one in the planning process. A court case is simply going to cost more money in legal defense, as well as construction costs. What is needed though is for the designers and councils to be made aware of the importance of abiding by these laws and the benefit of doing so, and we need more disabled people to speak out (but again, many don’t as they are dealing with their disabilities and doon’t want to be seen as agitators) . I’d be more than happy to come down to that bridge with my bikes, try the access, get some photos and fight for a fix. The critical thing is that if access isn’t possible, people won’t try it, and it’ll be assumed that access isn’t needed. Access needs to be possible (for everyone) so that we all can get out an use it. Maybe it needs to be related in terms of cost per user. The more people using it, the more cost effective it is and the better it looks to justify building it. they are obsessed with these chicanes for keeping naughty motorbike and scooter riders off the bridge… no doubt those barriers came out of the cycling budget as well. Why is it that highways can widen a road from 4 to 8 but fight the public for walking, cycling etc access. it’s pretty stupid really when they know it makes sense to have this for non vehicle drivers. they can’t say it about money cause with 8 lanes it proves they have it. Chicanes like that are dangerous by there very presence. You might ride past them fine twice a day for a couple of years then one day you clip your handlebar, break ribs and teeth or worse. They’re also hazardous when towing a child on a tagalong: so easy to crush the child’s fingers when trying to negotiate the turn. Really the best solution would be a wider bridge, say 3.6m to allow segregation of pedestrians. Would only have been slightly more expensive. When are we going to get a test case backed by a disabled cyclist? Depending on the location and any support and backing in the local area to make changes as a result of any test, I’d seriously consider testing the infrastructure, so long as the assistance to take it further was there (just because I’d be going out of my way to drive across country for a short test). In lieu of myself, I’d be happy to try to contact others that might be more local for such a test, as they would also make a more substantial argument for legitimate usage. Perhaps it’s worth compiling a nationwide list of infrastructure to test and establish any development trends successes and/ or failures to instigate planning changes prior to construction as well as current post construction modifications. A disabled cyclist definitely has more substantial means to invoke change legally, but as you point out, it’s many other people who would benefit and who are restricted or put at risk because of the infrastructure. The huge land grab required to widen that road as shown in the first two photos is rather shocking. I’m not familiar with the area, but I imagine all it does is encourage more people to drive rather than consider active transport, which is shamefully starved of funds by comparison. Prioritising motor vehicle use is a self-fulfilling prophecy that leads only to more land grabs down the line. Would it be in contravention of the Public Sector Equality Duty if people who had to use mobility scooters couldn’t use the facility? How are such people expected to get across the 8 lane carriageway? Using the carriageway?